Message: I am looking for liquid Procion. I am new at this and I love the way the fabric in silk reacts to it… I am a designer of silk blouses I love the way the dyes bleed together but I can not find anyone out there that knows where I can get any Procion MX in liquids. Also if I use this product, the powders do I have to wash silk in synthropol and soda ash first then let dry, put on my colors with gutta resist and then dyes? Pebeo Setacolor is a vivid line of fabric paints for apparel and home decor. 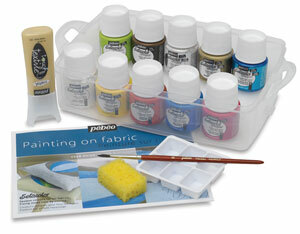 Setacolor transparent colors are ideal for hand painting on cotton, velvet, blends, and all-natural fabrics. Your artwork will become permanent once heat set. With silk, you have many different choices, because natural silk works well with both the fiber reactive dyes used for cotton and the acid dyes used for wool. Procion MX is not the only dye that bleeds together the way you like. Any good fiber reactive dye will work for you. The main question is whether you need a dye that will set at room temperature, or if you are willing to use a dye that must be steamed. If you’re okay with steaming, as serious silk painters generally are, then you have several good dye choices available. If you do not want to steam, then either you must use Procion MX dye, or you should give up on dye and use fabric paint, instead. Fabric paint, unlike dye, can be set with dry heat, such as by ironing. However, the colors you can get, while very bright, aren’t always 100% as bright or deep as those of dyes, and the fabric paint stiffens the fabric a tiny amount, even with the best fabric paint. I recommend you buy a small starter kit of a good silk paint, such as Setasilk or Dye-Na-Flow, and paint a silk scarf, to see whether the colors and the feel of the fabric suit you. They can be very nice. If you don’t like the feel or look of the silk paint, then you will probably want to take up steam-setting silk dyes. Procion MX dye, which is the dye used in tie-dyeing (as well as many other methods), has the fastest reaction time of all of the fiber reactive dyes. As a result, Procion MX dye can be set at room temperature, using soda ash to get the pH high enough, but the rapid reaction rate also makes it impractical to sell it in liquid form. The dye would not stay fresh long enough to allow for all the stages in wholesaling and retail selling before they go bad. You can dissolve your Procion MX dye powders at home and mix your different colors in amounts large enough to use over the course of several days. If you store them at room temperature, you can expect them to maintain full strength for at least a week, assuming you are very careful to never let any soda ash contact the dye stocks, or longer, up to three or even six months perhaps, if you refrigerate them. As the dyes in solution get older, however, they will tend to react with the water, leaving less of the dye able to react with the fiber in your silk. Colors mixed from more than one dye color will tend to shift in color, as one type of dye molecule goes bad more quickly than another type of dye molecule. Another drawback to using Procion MX dyes for silk painting is that the color chips for the premixed colors you buy are descriptive of the color produced by each mixture on cotton. Premixed Procion MX dyes will produce a different color on silk. For example, the same mixture of lemon yellow, turquoise, and cerulean blue will produce an aqua color on cotton but an emerald color on silk, but in the dye seller’s catalog will be pictured only as aqua. The color shifting occurs only when you set the dye with soda ash or other high-pH chemical. If you use an acid, such as vinegar, instead of soda ash, the colors produced are more similar to what you would get on cotton, but steaming is necessary to set Procion MX dyes when acid is used instead of soda ash. Procion H dyes are related to the Procion MX dyes, but they have one fewer chlorine atom on their reactive portion, so they react much more slowly. This means that they must be steamed after you have finished painting them onto your silk and letting them dry. If you are willing to go to the trouble of steaming, you will find that these dyes are much more versatile for silk painting, because you can work on a piece and then leave it alone for days or weeks before continuing your work on it, while expecting your jars of dye to maintain the same strength over time. We used to be able to buy powdered Procion H dyes and mix them ourselves, but they have largely been replaced for this purpose by another dye which is just as good. However, you can still buy ready-to-use liquid Procion H dyes, completely mixed with all the chemicals needed, in a wide range of dyes, from G&S Dye in Toronto. Remazol dyes, also known as Vinyl Sulfone dyes, are the replacements for Procion H dyes. Like Procion H dyes, they last for some time in liquid form and can be purchased already dissolved. It is possible to set these dyes at room temperature, on either silk or cotton, provided the right chemicals are included and the room is warm enough, but silk painters often choose to just paint their silk with the dyes and then steam them to set them. Getting the pH exactly right is not nearly as important if you steam-set your silk as it is when you set it at room temperature. Both Procion H and Remazol dyes are fiber reactive dyes, like Procion MX dyes. I like them because they are reliable, brilliant in color, resistant to light-fading, and because the manufacturers freely tell us what dye chemicals are in the dyes they sell us. 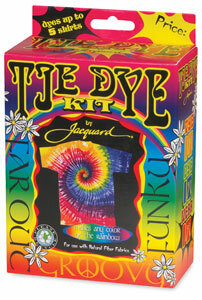 Another option for silk painting is to buy acid dye powders, such as the Jacquard Acid Dyes. As with the Procion H and Remazol fiber reactive dyes, you can use acid dye powders to mix your own dye colors that will last a long time in liquid form. They must be steamed to set. A different type of premixed liquid silk painting dye, often referred to as the French silk dyes, contains a wide range of different classes of dyes, including basic dyes, acid dyes, and some reactive dyes, premixed so that you do not know which types of dye are in a bottle. They require longer steaming than the Remazol or Procion H dyes (up to three hours). Different brands of the French silk dyes include Sennelier Tinfix Design, H. Dupont silk dyes, Pebeo Soie, and Kniazeff. They are known for producing very bright or intense dye colors. Unfortunately, in some cases they are notoriously poor at retaining their color when exposed to bright light, since some of them contain basic dyes, which are highly susceptible to light-fading. Their safety is also more of a question, because the manufacturers do not reveal what dyes they use in their mixtures. The exact choice of colors in any specific premixed dye is always a trade secret, but it should not be a secret what dyes are used in an entire dye line as a whole. Many silk painters have produced very beautiful work using this type of dye. I think that Procion H and Remazol dyes are an excellent and economical substitute. Also if I use this product, the powders do I have to wash silk in synthropol and soda ash first then let dry, put on my colors with gutta resist and then dyes? You shouldn’t put gutta on silk that you have already impregnated with soda ash. It is better to apply the gutta before applying any chemical. You can add soda ash to the liquid Procion MX dye mixture immediately before painting it on, pouring out just enough dye to use immediately, and saving the rest without mixing it with soda ash. The dye will last for about an hour after you add the soda ash to it. Alternatively, you can soak the silk (with any gutta lines already drawn, and heat-fixed if they are a water-based gutta substitute) in soda ash, hang it up to dry, and then paint with your liquid Procion MX dyes, preferably with urea mixed into the dyes to keep them from drying too quickly, as the dye-fiber reaction will cease as soon as the dye is completely dry. You must pour out a small amount of liquid dye mixture to dip your brush in, because the brush will transfer soda ash from the dry silk to your container of dye, so it too will start to go bad soon. Don’t dip your brush into your whole bottle of dye solution, because it will go bad if you do. Some silk dyers say they have no trouble with dyeing silks purchased from a dye supplier, such as Dharma, without prewashing the silk, but silk clothing and silk yardage that are not sold by dye suppliers always do need to be prewashed, as otherwise there may be streaks of sericin or of traces of oils and finishes from the weaving process that may create undyed streaks in the dyed fabric. Adding some soda ash to the load of wash will help to get the fabric cleaner than using Synthrapol alone. However, this soda ash is removed when the fabric is rinsed, so it is no longer present as a dye fixative when you paint the fabric. You have to soak the silk in soda ash separately and not rinse it before hanging it up to dry, if you choose to use soda ash. Please note that soda ash softens silk. If you want your silk to remain as shiny as possible, with its original stiffness, you should never use soda ash or any other high-pH chemical. Always use steaming, without soda ash, to set the dye in silk whose original sheen and texture you wish to preserve. This entry was posted in about dyes on July 9, 2014 by pburch.